Dr. Shadi Khoshbin uses her dental training to serve the men and women of Granada Hills, California alongside her husband, Dr. Kamran Rafie. Together, at Granada Hills Dental Group, they provide cutting edge dental care. Dr. Khoshbin was born in Tehran, Iran where she attended a French school. After graduating from high school in Iran, she emigrated to the US, and in 1992, graduated from UCLA with a biology degree. 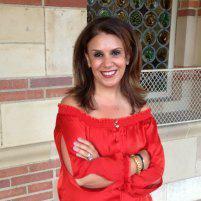 Dr. Khoshbin then received her dentistry degree from USC in 1998. Shortly after graduation, she began practicing in Granada Hills, California. Dr. Khoshbin takes the time to listen to her patients make them feel comfortable and relaxed. Dr. Khoshbin is very gentle and compassionate and is multilingual. She speaks English, Farsi, French, and Spanish fluently. Besides being a devoted mother with two teenagers, her interests include reading, playing tennis, traveling, participating in book clubs, and helping with fundraising for the local high school.